wine lovers will find that America’s Heartland plays host to an endless variety of delectable adventures and culinary experiences. Fill in the form below and we'll send you an email with all our current deals for Illinois. Cooking, Dining and Touring in the Windy City! Learn to Bake like a Professional. Join 312 Chicago and Pastry Chef Allison Levitt for a wonderful series of interactive cooking classes. Our new series of pastry classes will focus each month on a different country/region and its classic desserts. Join us for great Friday evening dinner parties and Sunday afternoon workshops as Liz Clark guides you through hands-on preparation of some of the world's great dishes. Cakewalk Chicago offers wonderful classes that are great for get-togethers and gifts for co-workers, friends and family. Or give a gift certificate for supplies and classes and let them bake you some smiles!!!! The Calphalon Culinary Center is available for corporate events and private parties. We offer Hands-On or Demonstration Cooking classes, Cocktail events, Wine Tastings, Meeting Space, and Formal, Banquet, or Buffet Dining for small groups. All classes are conducted in the comfort of your own home and are designed so that you can easily reproduce each item after taking the class. Madelaine Bullwinkel teaches French cooking techniques at Chez Madelaine Cooking School, now in it's 30th year. She incorporates hands-on experience with the "why" and "how to" in her award-winning contemporary kitchen. "Our passion is to share the simple art of cooking from scratch.” You'll find that our classes are a great way to collect and create new recipes, try the techniques used, and learn in a relaxed atmosphere whether you've been cooking for years or never stepped foot in the kitchen. Our scheduled cooking classes are a great way to meet others who share your interests. Each hands-on class is limited to 12 students, and includes a tasting in the kitchen and handouts, which can be used later as a helpful reference tool. Every class features a different chef and everyone who attends a class is given a sampling of each dish. Printed copies of the recipes are also provided to follow the chef's instructions and methods during the class. If you pass by our shop on a Tuesday evening, you’re likely to be very jealous -- inside are 8-20 people, gathered around our demonstration counter listening, tasting, asking, learning…enjoying. Customized classes are created for you and taught in your own kitchen or in a large demonstration kitchen in Evanston. You can choose to learn basic or intermediate skills. Choose to hands-on experience or just kick back and watch the chef create a meal for you to enjoy! Our new class schedule offers a range of great original menus that can inspire us in our home cooking and entertaining. Saturday classes will provide "hands on" opportunities to hone your cooking skills. Hone your cooking skills. Maybe you have a favorite dish, but are clueless how to prepare it. Maybe you have cooking equipment that you don't even know how to use. Whatever level you're at, we can create a lesson that is fun and educational. Laugh, eat and share your passion for cooking with new friends. Our kitchen is warm, inviting, and above all, a comfortable place to build confidence for your own cooking successes. On “The Second Floor”, Fuller’s Home & Hardware features a demonstration kitchen, along with products for all your home needs. Please look through our selection of cooking demonstrations and enroll in a class. Enjoy delicious food and the atmosphere of our state of the art residential kitchen. Gorton offers cooking classes, on site and off site at local restaurants throughout the year. Join one of our celebrity chefs for an afternoon or evening of great cooking tips, great cooking, and great eating! We're always stirring up something interesting at the Recreational Cooking School at Kendall College! We offer a cornucopia of practical, fun classes for every home cooking enthusiast. Your experience at Rasoi will be interactive, hands-on, fun, while you learn about north Indian cooking, share cooking tips, experience cooking with Indian spices and eat a home cooked Indian meal. At Pied Piper, we have created cooking classes to stir up the imagination of little sprouts as young as 2 years old to the junior chef. Classes are designed to be hands-on and investigative. Ranjana’s cooking classes are hands-on, informative, and interactive. Generally, each three-hour class includes a nine-course sit down dinner. Someone’s In The Kitchen offers cooking demonstration and participation classes conducted by local area chefs. Come enjoy the food, learn a new kitchen secret, and take home great recipes. The Chopping Block Cooking School, with two locations in Chicago, offers daily hands-on and demonstration cooking classes for the home cook. Our classes are intimate and interactive, and subjects change monthly. The Rustic Kitchen cooking school emphasizes stylish casual entertaining. Our classes ensure dinner party success every time, without the stress and exhaustion that novice cooks feel when they entertain. Join Executive Chef Michael Pivoney as he demonstrates the techniques needed to create the perfect brunch, gourmet dinner and cocktail reception. The heart of The Wooden Spoon is the state-of-the-art kitchen. Custom-designed with Viking appliances and a unique oval countertop to create a comfortable setting for our cooking school or the perfect backdrop for your next party! Two Kitchens is a complete cooking school featuring the latest Viking products. Our classes range from basic skills such as sautéing or roasting to sophisticated offerings like wine and food pairing and international cuisines. Want to learn some grilling tips from our experts? Attend our indoor cooking classes year-round. The demonstration-style, indoor classes last approximately 3 hours. Classes begin at 9am and are always scheduled on Saturdays. Great beer, food, and music! This unique festival offers something for everyone from the mushroom enthusiast to the curious observer! The Route 66 Smoke Out Competition is sanctioned by KCBS and is an Illinois State Championship competition. A friendly gathering of Homebrewers sharing their beer with you! Taste local craft brews and food from popular restaurants, while enjoying Garfield Park Conservatory. Celebrating those who brew Illinois beer, drink Illinois beer, and support Illinois beer. Over 100 beers, live music, and good times. Featuring live entertainment, craft festival, business expo, dishes from local restaurants and vendors. Chocolate strawberries, chocolate popcorn, chocolate cake, chocolate donuts, chocolate martinis, chocolate and much more. Serving up an authentic dose of "filoxenia" (Greek hospitality & generosity of spirit) with flavorful food, great music, dancing & pure fun. The Chicago region's award winning Mexican restaurants & chefs will set up outdoor kitchens & serve up their signature dishes. A celebration of art of brewing and local fundraising event. All event proceeds will benefit No Kid Hungry’s work to end childhood hunger. The best of Illinois wine and outstanding jazz. Unlimited samples from 40+ breweries, live music and food from local restaurant vendors. Chicagoland restaurant BBQ masters compete for the title of "Best Ribs" plus rib-eating contest and nationally recognized Indie music festival. Get ready to go wild, craft beer lovers. Traditional & exotic tortillas paired with tequila cocktails ranging from the margarita to the Paloma, zesty Sangre Maria, & El Diablo. A line up of great food, contests, sports, and musical entertainment that appeals to everyone, while embracing the traditions of Joliet. Ribfest recruits 16 of the country's best rib vendors to cook in a nationally recognized BBQ contest. Major music acts as well as community talent. Featuring local restaurants selling their specialties and free entertainment each night. 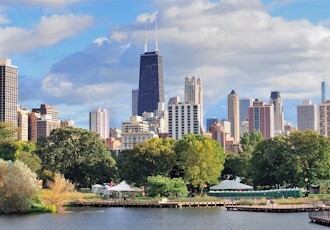 Taste of Chicago is the nation's premier outdoor food festival showcasing the diversity of Chicago's dining community. We have musical acts for every taste, eclectic fare from local restaurants and selections from the best regional craft breweries. Showcases over 200 unique beers from craft breweries around the country. Home of Lenders Bagels - world's largest free bagel breakfast, bagel contests, entertainment and more. Celebrate microbrews from both the Midwest and throughout the entire U.S.
A true celebration of Far East beauty and culture including food, art and music. Fireworks, 5K run/walk, medallion hunt, kids zone, car show, and Corn Boil Cooking Challenge! This iconic event boasts four music stages, food, the Lill Street Craft Fair and lots more! Join us for the best party in Wheaton. 'Frankly' speaking, Chicago Hot Dog Fest is a guaranteed 'wiener'! The largest free vegetarian food festival in the country. Another great party with vendors, food demos, speakers, and a fabulous food court. Local farmers display famous Calhoun Peaches handpicked that morning & still warm from the sunshine plus tomatoes and watermelons. Taste of Greektown is a romantic weekend celebration for lovers of Mediterranean culture. Fresh sweet corn, sidewalk sales, arts, crafts, & flea market await you! Come out and enjoy the fun, food and some of the best blues music around.